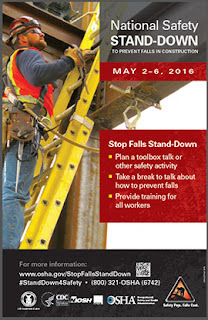 OSHA has designated May 2-6, 2016, for the third annual National Safety Stand-Down. The event is a nationwide effort to remind and educate employers and workers in the construction industry of the serious dangers of falls - the cause of the highest number of industry deaths in the construction industry. OSHA, the National Institute for Occupational Safety and Health and the Center for Construction Research and Training are leading the effort to encourage employers to pause during their workday for topic discussions, demonstrations and training on how to recognize hazards and prevent falls. More than four million workers participated in National Safety Stand-Downs in 2014 and 2015, and OSHA expects thousands of employers across the nation to join the 2016 event. To guide their efforts, OSHA has developed the official National Safety Stand-Down web site with information on conducting a successful stand-down. After their events, employers are encouraged to provide feedback and will receive a personalized certificate of participation. The National Safety Stand-Down is part of OSHA’s ongoing Fall Prevention Campaign. Begun in 2012, the campaign was developed in partnership with the NIOSH National Occupational Research Agenda program. It provides employers with lifesaving information and educational materials on how to take steps to prevent falls, provide the right equipment for their workers, and train all employees in the proper use of that equipment. OSHA has also produced a brief video with more information about the 2016 Stand-Down in English and Spanish. See the final data report on last year’s Stand-Down (pdf). Learn how to participate in the 2016 Stand-Down. Learn more about preventing falls in construction. Browse Construction Safety signs and labels or Fall Protection PPE signs.